With the summer upon us and barbecue grills firing up all over the state, it’s a good time to try this one out. This recipe comes from “Country Cooking…California Style”, a cookbook published by the California Farm Bureau Women. With the summer upon us and barbecue grills firing up all over the state, it’s a good time to try this one out. The recipe came from Nancy Rosasco of Tuolumne County. In a large screw jar, combine the chopped onion, cooking oil, red wine, lemon juice, salt, minced garlic, bay leaf, and peppercorns. Shake well and let stand at room temperature for 2 hours, shaking occasionally. Place beef in a shallow pan and pour marinade over and marinate meat at least one hour. While meat is marinating, prepare grill for barbecuing and light the briquets at least 45 minutes before serving time. 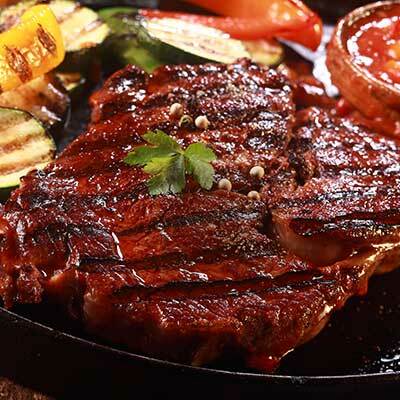 Grill steak over hot coals to desired doneness and serve on warm plates. Serves 6-8. Note: This can be broiled as well as grilled. You can prevent steaks from curling while on the grill or broiling by making diagonal slashes at 2-inch intervals in fat along the outer edge of the steak. “Country Cooking…California Style” is a cookbook published by the California Farm Bureau Women. Each recipe may have additional information on where it came from.